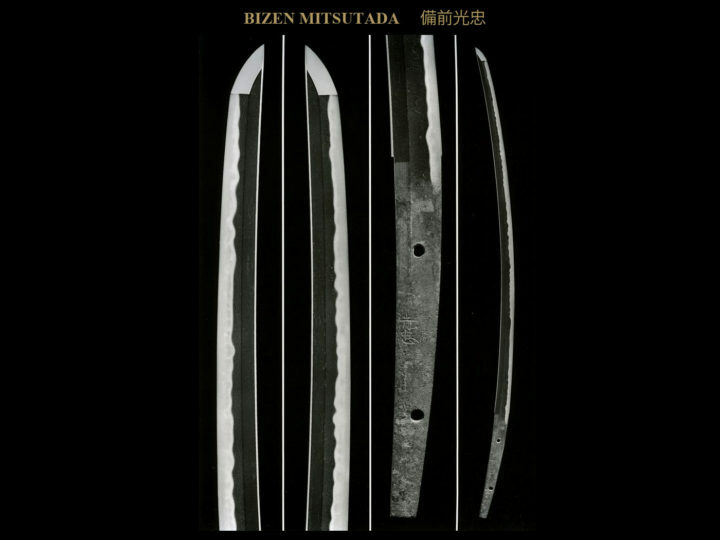 Bizen Nagamitsu (備前長光) was the son of Bizen Mitsutada (備前光忠) who was the founder of the Bizen Osafune School (備前長船). The works by Nagamitsu (長光) closely resemble the craftsmanship developed by Mitsutada (光忠). This is especially true in his early career. While they contain exuberant choji-midare like Mitsutada’s (光忠) works, they differ, however, in that they also contain dominant gunome and more pointed variations of choji than his father’s works. The thinking in the past was that there were two generations of smiths who used the name Nagamitsu (長光). The first generation Nagamitsu (長光) was thought to have been productive in about the Bunei and Koan eras (1264-1287). The nidai was thought to be a smith who signed Sakon Shogen Nagamitsu with representative works from the Einin and Shoan eras (1293-1301). 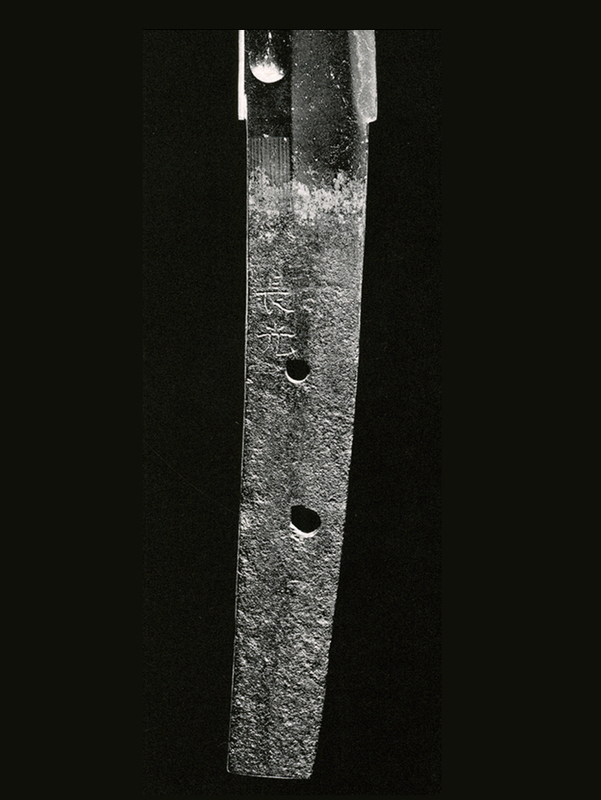 The “two generation” theory stems in part from the fact that there was a distinct change in the style of workmanship of blades made around Einin and Shoan eras (1293-1301). 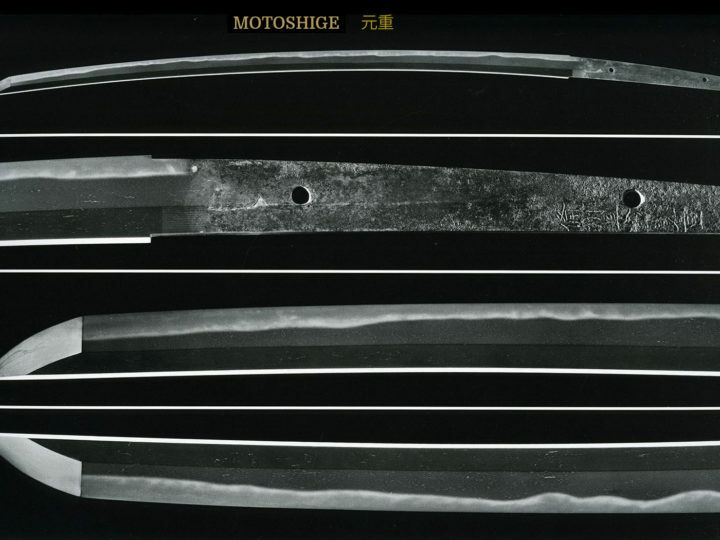 That is, prior to the Einin era most of the blades exhibited luxuriant, irregular patterns resembling Mitsutada’s (光忠), but after Einin, his blades have a quieter appearance with a somewhat more subdued irregular pattern occasionally even a straight pattern (suguha). The “one generation” theory assumes that there was only one generation of smith who used the Nagamitsu (長光) name, and that the former type of blade represents his earlier days and the blades change to the latter type as he went into the last half of his career. Adding to the “two smith” theory is the fact that there was a slight change in the final stroke of the “mitsu” character when he incised his name on the tang. The style he used in the latter half of his career (or by the second generation depending on which school of thought you adhere to) continued to be used by important Osafune smiths following Nagamitsu (長光), i.e. Kagemitsu (景光), Morimitsu (盛光), Yasumitsu (康光), etc. 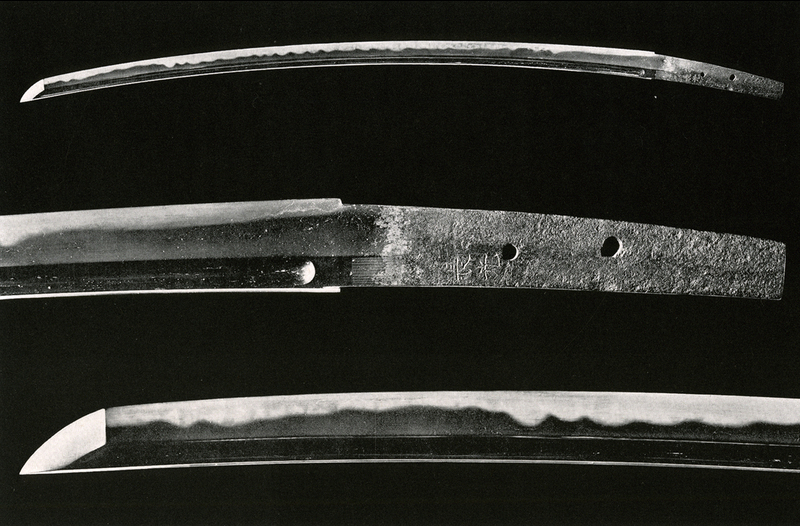 As with many areas of the history of the Japanese sword, the research continues and opinions will, without a doubt, be amended or changed in the future. Current opinion tends to lean toward the one-generation theory and a change in working styles by the smith. 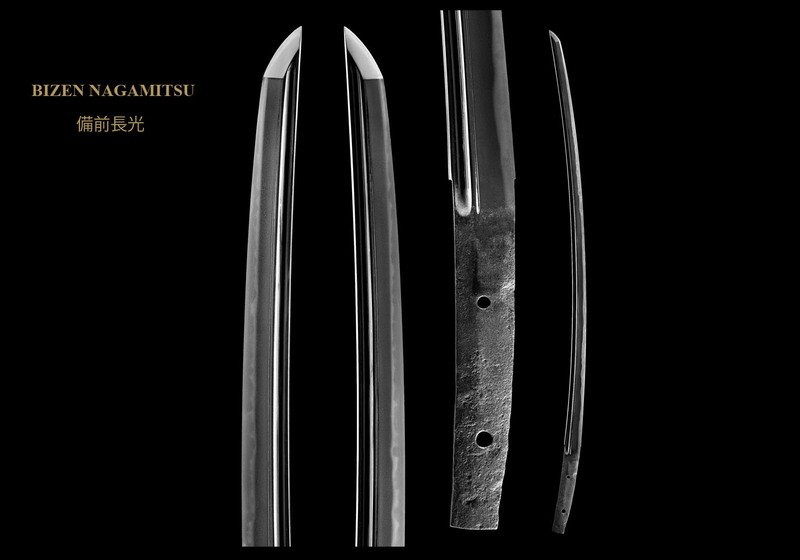 Irrespective of whether there were two generations or not, blades produced by the Nagamitsu (長光) smith(s) are of exceptional quality having six swords designated as National Treasures and no less than 28 blades designated as Important Cultural Properties. 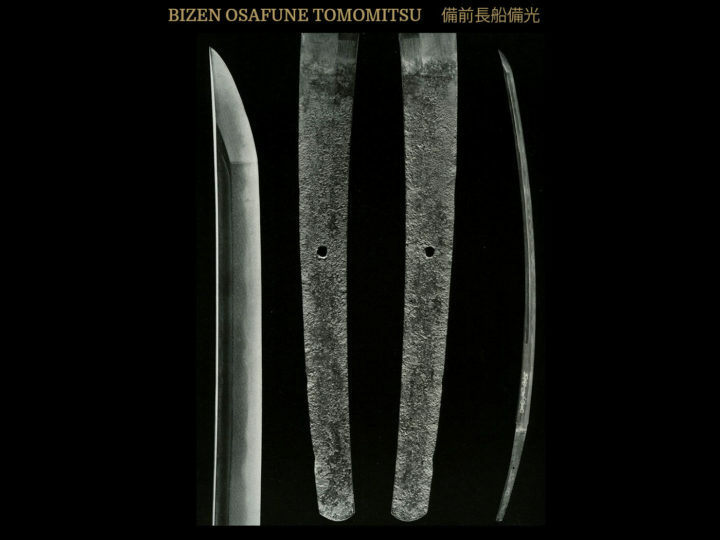 Further, among the old famous swords which exist today, there is no swordsmith who has left behind a number of works that surpasses those of Nagamitsu. This shows not only the high esteem in which his swords were held but also that fact that they we so well made as to stand up to the rigors of battle for hundreds of years. SUGATA: The sugata exhibits the features characteristic of the Kamakura period and is like the Ichimonji School of the same time. Generally, blades are shinogi-zukuri, iori mune with koshi-zori. There is a marked tapering approaching the point (funbari). Occasionally among Nagamitsu’s works an unusual sugata may be seen which resembles the works of the early Kamakura period. Others may have a shallow sori and a mihaba (width), which does not vary greatly from the bottom to the point. JITETSU: The kitae is ko-itame mixed with small mokume, making a fine and beautiful grain. The ji-nie is also fine and the midare-utsuri or choji-utsuri will appear in a pronounced manner. HAMON: The hamon will be nioi-based, as is the case with Bizen works. 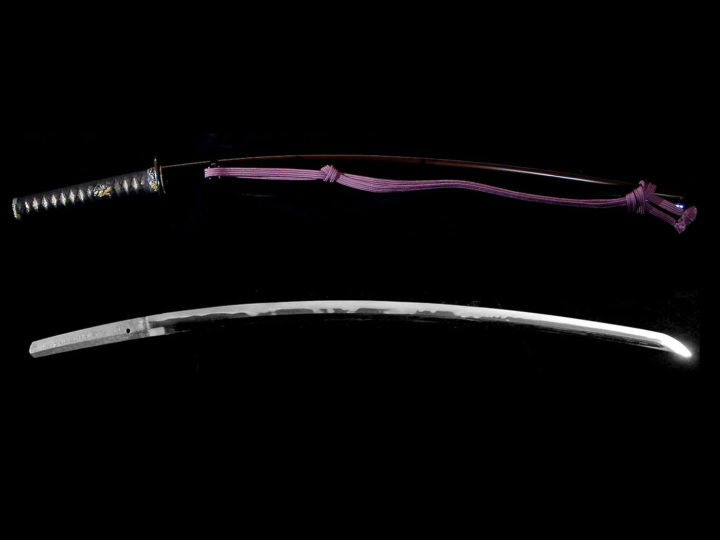 Nagamitsu’s hamon is distinctive in that while it resembles that of his father, Mitsutada, having a mixture of various kinds of choji mixed with occasional gunome. In Nagamitsu’s hamon, however, the gunome are much more profuse and will have rounded heads and, in effect, resemble choji. Mitsutada never made hamon with any portion being suguba in nature, while Nagamitsu was known to make straight hamon on a rare occasion. BÔSHI: The boshi of Nagamitsu is an important kantei point. In most cases (there are always exceptions), he was known for what is called the “san-saku boshi“. This boshi is called a san-saku boshi since three swordsmiths, Nagamitsu, Kagemitsu, and Sanenaga made it. The characteristics of this type of boshi are that it is fairly straight when crossing the yokote and then it slightly undulates in the mid point ending in a maru shape with kaeri. HORIMONO: Bo-hi are commonly seen with the tops of the hi being pointed in nature. Futatsu-hi is also seen. Bonji can be found on his works on occasion. NAKAGO: Not many ubu blades exist, but in general the nakago will be made a little short with the tip in kurijiri or kijimomo. The yasurime will be kuri or sujikai. The mei will generally be given in two characters. MEI: Nagamitsu has left behind a great number of works. His most common signature is the ni-ji mei, but he also used a few others.